In Arcata, the Nuclear Weapons Free Zone and Peace Commission and the Committee on Democracy and Corporations sit idle for lack of a quorum. One year after its inception, the Occupy Movement has little visible presence. The Arcata Service Center is unfunded and inactive. Certainly, there are still many non-profits, churches and other organizations doing good work in our community, but the cutting edge, “only in Arcata” City committees have effectively ceased to exist, and our incumbent City Council, while adequately competent, has failed to initiate any progressive reforms and can’t even get construction going on a public restroom. Three people who decided to run for council couldn’t complete the simple task of gathering 20 valid signatures. Nobody is stepping forward with any sort of platform of real change. What’s up? Are grassroots democracy and civic action asleep in Arcata? If so, why? People are busy. They must work harder and longer just to stay above water. There are more families than ever before with both parents working. Rather than ensuring financial security, or paying college tuitions, two wage earners are often necessary for survival. This means much more rushing about, ferrying kids and making it to work, and much less free time, relaxation, and time to pay attention to what’s going on in the larger world. People are afraid: afraid of losing their jobs, afraid of getting sick or somehow falling behind on their mortgages or rent. They are afraid that their children will not have as much opportunity as they did. They are afraid that if they take a stand on political or social issues, they will be spied upon by the government and potentially get in legal trouble or have their employment threatened, or their businesses may be boycotted by opponents. They just want to keep a low profile and remain invisible. People think that symbolic exercises in citizen power are worthless and somehow immature. “We are grownups and we must be realistic.” These folks fail to realize that our understanding of the world is symbolic, and a collection of powerful local actions can have wide-ranging influence on national policy. People don’t believe that anything they can do will help. The problems are too big, our voices too small. The mainstream corporate media reinforces this belief by ignoring small demonstrations and people who speak out on important issues, unless they get arrested or garner negative press by engaging in violence. If we agree that the world, and our government, and our social and economic system are seriously messed up, what can we do to improve things, besides being informed about candidates and issues and voting intelligently? I encourage folks to get involved in at least one project that really ignites your passion. You could be feeding hungry children, or protecting a threatened species, or reducing air pollution or working to stop a war, or defending freedom of speech. Maybe you only have time to sign a petition. Do it, and if you can, send it to a few friends. Maybe you can demonstrate for a cause, write a letter to the editor, or just talk about your issue with your friends. Volunteer for a City committee or a non-profit board. Or maybe you’ll just take good care of your family and tend your garden. Just do what you can, and the world will be a better place. We, in Arcata, at “Corps Ain’t Peeps,” have been working on a parallel course for the past year, writing and advancing a ballot initiative ordinance. We gathered over 1200 valid signatures, thereby qualifying as “Measure H” for the ballot on November 6. Thank you, all who signed the petitions. Measure H states that in Arcata, to the full extent legally possible, corporations shall not have the rights of people. The ordinance is specifically worded so as to avoid the threat of a costly legal challenge. This measure is complementary to the efforts of Move to Amend and includes a call for a constitutional amendment stating that corporations are not people and money is not speech. Those of us working on the ordinance have put in a lot of time on the project, because we believe that we must reduce the corporate influence which is subverting our democracy. Our local ordinance, if approved by a large majority of voters, can encourage other cities and counties to enact similar measures. It is a baby step forward in the process of education and political organizing on the issue of corporate personhood, but it is a baby step that we are able to actually accomplish. We are driven to action by the enormity of the threat. As a result of the Citizens United decision, super PACs will spend close to ten billion dollars this election, nationwide (study by Borrell Associates), to support candidates who will further the economic interests of their corporate sponsors. Some say that corporations should have the rights of people because they are made up of people, but a business incorporates to create an entity which insulates the individual human business owners from personal liability. A corporation is, by intent, a non-human entity. If a corporation claims personhood, it is attempting to secure the benefits of being both a non-human entity and a human being. This is double-dealing. It is wrong. With the passage of Measure H, we hope to nurture and expand democracy in our community and our nation. Just as a voter petition designated Arcata as a Nuclear Weapons Free Zone in 1986, and Measure F, in 1998 created the Committee on Democracy and Corporations, Measure H will put Arcata on the record as standing up to Corporate Rule. Democracy means governance by the people, and only persons who are living, breathing human beings should be able to participate in the democratic process. 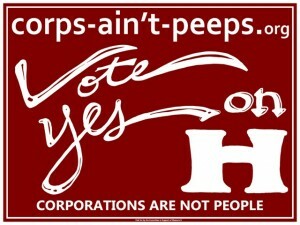 You can help to get the word out about Measure H. Please visit corps-aint-peeps.org. You can read the full text, publicly endorse Measure H, request yard signs, donate money or volunteer to help. You can also find us on Facebook at corps-ain’t-peeps, or you can call Dave Meserve at 834-3612, or David Boyd at 498-4209. We all know that it’s true. They’re not like me and you. Dave Meserve lives in Arcata where he designs and builds custom homes and political actions. This entry was posted on Tuesday, October 2nd, 2012 at 10:04 am	and is filed under Opinion, Business. You can follow any responses to this entry through the RSS 2.0 feed.